Conductive Trays Make Great Conveyor and Assembly Trays. 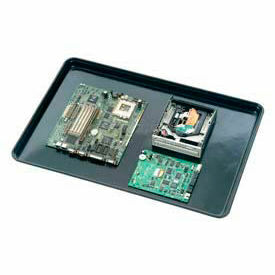 Conductive trays meet the requirements of ANSI/ESD S 20/20. These trays are used in the assembly of circuit boards, computers, medical devices, and other types of electronic or static sensitive assembly. Molded of black thermoset composite material with permanent surface resistant of 105 ohms/sq. ESD Impregnated Corrugated Trays Are Designed To Transport Or Store ESD Sensitive Items. ESD Impregnated Corrugated Trays are made of 100% recycled impregnated corrugated fiberboard or polypropylene with a steel wire frame for long lasting durability and dependability. Variety of sizes and styles available to meet shipping and storing requirements. Board Handler Trays stack and nest together to improve productivity and saving space. Static dissipative foam (RTT 10E6 - 10E7 ohms) laminated to bottom. 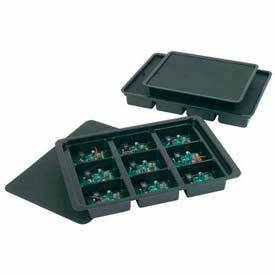 Stackable and Nesting Wire Corner Super Tek-Tray provides reliable path-to-ground protection. Allows trays to stack improving productivity and saving space. Static dissipative foam bottom provides ESD and shock protection. Used for use where corrugated and/or paper products cannot be used. Reusable. Made in U.S.A. Some models require assembly. Styles are Board Handler and Tek Trays. Color finish is Black. Dimensions and temperature tolerances vary per style. Package quantity is 1. 1 Year Limited Warranty. 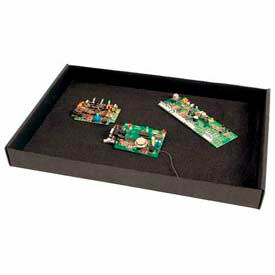 Conductive Kitting Trays Are Used Kitting And Organizing Workstations. Conductive Kitting Trays are made of conductive plastic for long lasting durability and dependability. Variety of sizes and cell quantities available to meet workstation storage requirements. Used container for Kanban. Die-cut-drop-in covers available separately. Reusable. Made in U.S.A. No assembly required. Styles are 4 Cells, 5 Cells, 9 Cells, 10 Cells and 12 Cells. Color finish is Black. Dimensions and compartment sizes/quantities vary per style. Package quantity is 1. 1 Year Limited Warranty.